Below is a collection of some of the great websites we've been collecting over the years. Read over the brief description of each link below to see which ones will best serve your needs and then just click on them. They are divided into ESL and COUNSELING links, but many overlap into both categories, so we recommend checking them all out. We hope they serve you as well as they have served us! Edutopia- What a great, great site with articles on the latest and most cutting edge topics in the education field. This is the site I use for sending articles to my principal to convince him to support a best practice counseling program! Kids Health - A wonderful site for info, videos, and resources on every health topic you can imagine. They have especially good mental health resources. The Counseling Geek- A wonderful website with an incredible blog detailing all the latest ins and outs of the school counseling profession, with a focus on technology. My absolute favorite post is Be Data Inspired- you can can't find a better tutorial on using data software to advocate for yourself, your kids, and your profession! Elementary School Counseling Exchange- Wow! This Facebook group is one of the most active ones I've seen. Constant commentary with lots of experienced counselors sharing materials and giving expert advice. From the Counselor's Office- This guy writes really insightful commentary on issues facing school counselors and counseling in general. His post, "Wrong Questions and Quick Fixes" is a must read! 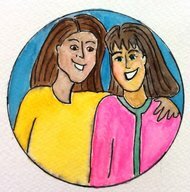 The Helpful Counselor- This is a really well put together website that links to the author's TeachersPayTeachers products and blog; her blog topics are super helpful! Extraordinary Schcounselor - a great blog written by Tracy Jackson, who is a school counselor and counselor coordinator. I have found some of the most intriguing and informative articles on her site! Engames- This is just a really neat site that has a ton of grammar structure as a free resource. Grammar Monster- This site has super resources for ESL teaching techniques and lessons. Edutopia- What a great, great site with articles on the latest and most cutting edge in education field. English Club- A good site for finding helpful ESL resources, especially clear and detailed grammar structures charts! Kid World Citizen- This is a really fun site for kids (and teachers!) to learn and contribute about cultural aspects of countries around the world. There are also tons of great ESL ideas/resources tucked around this site like the feature on bilingualism in adoptive families and books about Christmas in Mexico. Tips to Managing a Busy Schedule for Teachers - If you are a beginning teacher, this is a really helpful page of PDFs and links to articles about setting up your classroom and teaching procedures. Teachers Pay Teachers - LOVE THIS SITE of teaching/counseling/ESL materials with tons of free and low-cost goodies you can download. Teachers with a Sense of Humor - Great resource if you need cartoons/quotes for a presentation...or if you just want a laugh. International Schools Review Forum- Excellent source of info for working in education abroad, lots of helpful info related to both ESL and counseling. USDE Ed Pubs - tons of free publications on anything educational, lots of counseling and translated pamplets here. 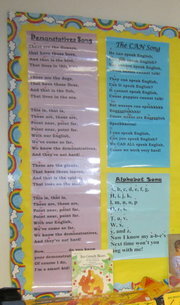 Busy Teacher - I love the ESL posters on this site! Much of it is free, just navigate around. Fluency MC's Blog - Great, great post which features 34 leading names in the ELL field and their thoughts on "How to Speak English Fluently." Also, all the 0ld "Free to a Good Home" Products are NOW on the bottom of this page (just scroll down) to make way for the new ones All of our coolest, newest free products are now up on our Home Page, so check them out, too! This activity is really helpful in engaging students because it gives them something new and interesting on which to practice or apply their newly learned language concepts. Plus, who doesn't love valentines in the ESL/EFL classroom? 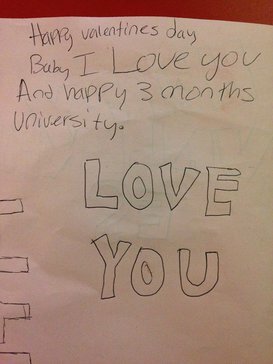 Check out the student-penned love note that a colleague found at our school years ago! Do you work with underachieving students or clients? If so, this game is right up your alley! 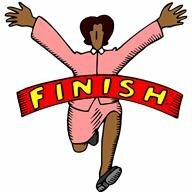 The No Zeroes Race is a fun and positive way to help students monitor and decrease their zeroes in the gradebook! To motivate your students to decrease their missing assignments that earn them zeroes in the gradebook, fill in the No Zeroes Racetrack each session that you meet with students. 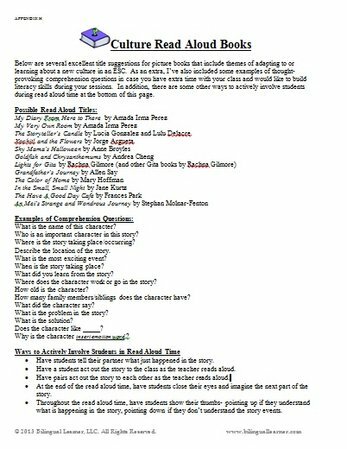 Check out this lesson that uses the amazing picture-book-with-a-shocking-twist, The Wretched Stone. Your students of any age group will be captivated by this story! Celebrate team work with fun activities combined with a lively discussion about the hidden meaning in the story. Happy Reading! 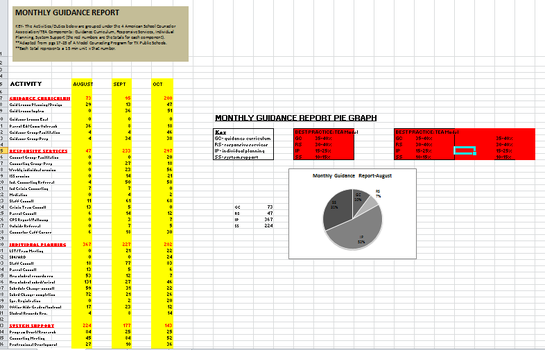 This data tool will help you show your administrators exactly what it is you do all day as you spin from one (or 10!) student/s to another! Here is a template that allows you to make quick tallies to show 15 minute increments of your time, and then total it all up once per month- Excel even lets you show it in neat pie charts. *FYI- Google Docs wouldn't let us put our pie charts into the template, so click the Facebook icon at the bottom right side of this screen and message us through our FB page if you'd like to receive the pie charts, too. When a new student arrives, do you have to drop everything for an hour or more and make their schedule? Well, not anymore! 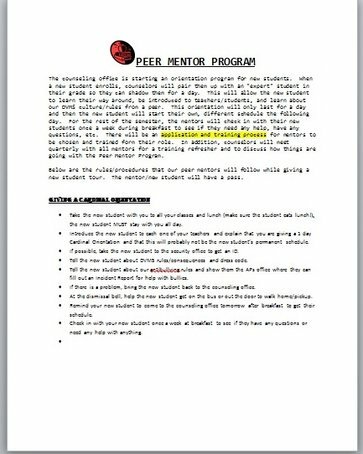 This unique and innovative program will show you how to train your students to be mentors who take the new student on an all day tour while they help them transition to the school on their first day. Meanwhile, you can take your time to make the best schedule possible for the newbie! 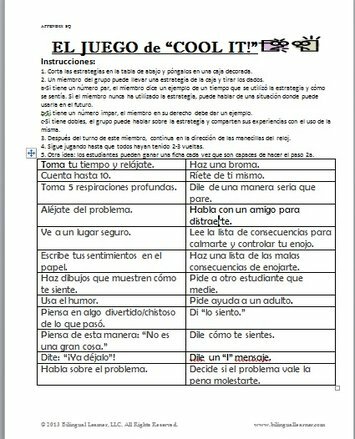 Bilingual Anger Management Game- El Juego de COOL IT! This fun and motivating game allows students to pick an anger management strategy and practice role-playing it! Excellent practice in any language for this kids who need it most. ESL for Beginners Culture Explorers- Great Read Alouds with Activities! Why not read some engaging literature aloud to your ESL students so they can see how others have experienced new cultures? The books on the list below all provide wonderful opportunities for your students to see that they aren't the only ones going through culture shock or trying to understand the English-speaking culture. 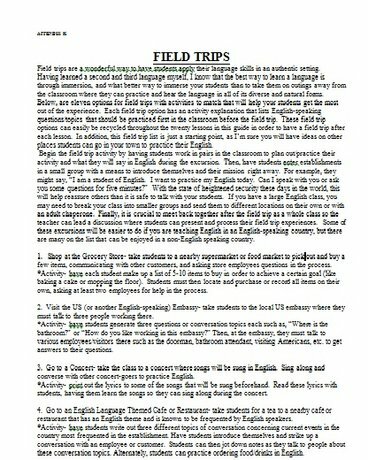 ESL for Beginners Volume Two- English-themed Field Trips! Take a break from that classroom and let your students learn from real life! This free product includes many different ideas for fascinating field trips in your neck of the woods! 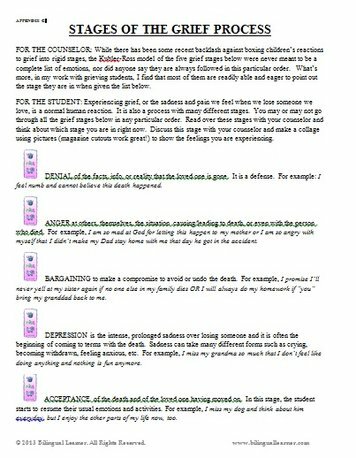 This free product lets your student explore the grief process and identify their place in it. A followup collage activity encourages the student to reflect on their feelings, the first step on the road to feeling better. These fun, engaging activities will enrich any language lesson! They work great as the focal point of your ESL lesson, as practical applications, or even as a relaxing, 'break' from the traditional ESL lesson. This individual counseling notes worksheet will provide a thorough, timely way of keeping all the important points of your individual counseling sessions in one concise place- there's a section on the individual counseling notes sheet for your session plans and activities, another section to notate goals and specific behaviors to work on during the counseling session, and also a section to write your counseling session summary notes. These two counseling products provide valuable information about anger management for your students. Use them in your early anger management group sessions to teach them about the dangers of repeated, uncontrolled anger on their health. This bilingual Halloween passage will introduce your new bilingual/ESL students to the traditions and history of this popular American holiday. The passage is in both English and Spanish- giving students a chance to practice their English acquisition while grasping all the concepts with the Spanish translation. In addition, the fill-in-the-blank aspect of the bilingual Halloween reading gives students a chance to apply what they are learning rather than just reading/listening.